NERAHMS: North East Regional Association of Housing Maintenance Supervisors | NERAHMS works to maximize the quality of the services its members provide to residents of affordable housing units in Connecticut, Maine, New Hampshire, Rhode Island and Vermont. NERAHMS works to maximize the quality of the services its members provide to residents of affordable housing units in Connecticut, Maine, New Hampshire, Rhode Island and Vermont. We do this by providing on-line and in-person networking and training opportunities. 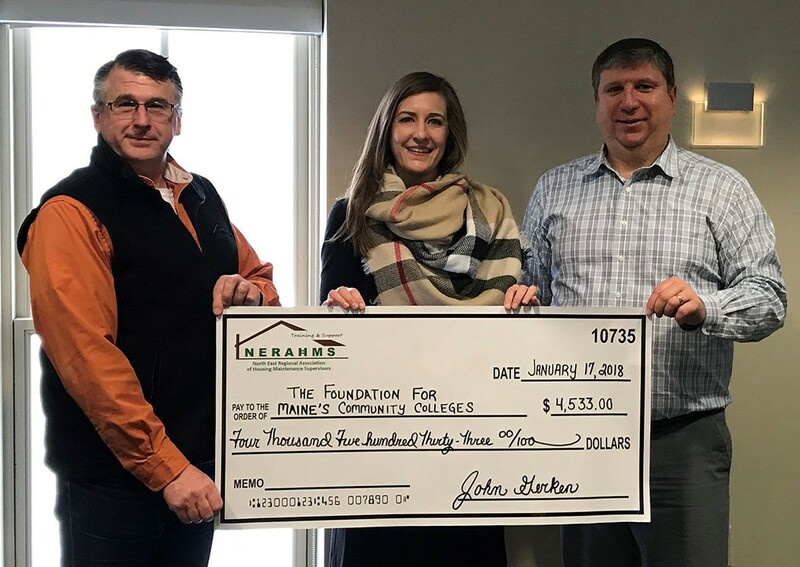 January 2018 – John Gerken (l), Chair of NERAHMS and Jonathan Clark (R), Vice-Chair of NERAHMS, present a check to support scholarships for building construction technology students at Maine’s community colleges to Jane Phillips, President of The Foundation for Maine’s Community Colleges. The Fall conference consists of a benefit golf tournament, a trade show that gives access to and highlights the latest in innovative technology and products, as well as classes geared toward front-line Maintenance personnel and Supervisors alike. The spring trainings provide trainings on many important topics, from changes in HUD regulations to required safety trainings to hands-on how-to courses. Past spring trainings have featured ladder safety, OSHA rules & regs, lead based paint, blood-borne pathogen training, and shrub and landscape maintenance to name a few.